It's election year in the region's largest city and the race for Miami mayor has just become a little more interesting. City Commissioner Francis "Frank" Suarez, 35, will officially announce a challenge to incumbent Mayor Tomas Regalado today. HE'S RUNNING: A Miami city commissioner since 2009, Frank Suarez grew up during his father, Xavier Suarez's, four terms as mayor. "It was definitely a lesson for me. 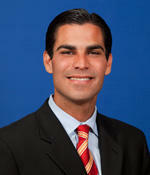 I've lived and experience Miami politics all my life," Suarez told WLRN-Miami Herald News. " I've seen the good and the bad. I understand that sometimes I'm going to be criticized unfairly." Suarez also says he wants to elevate the mayor's job to a more prominent stage. "Miami does not have a mayor on the national and international scene," the commissioner explained . "(We) don't have the ability to influence public policy." According to The Miami Herald, Suarez has already raised $460,000 towards his bid for mayor while Regalado has only raised about $160,000 for his reelection efforts. Suarez was first elected to Miami's commission in 2009, representing the same district that Regalado left to run for mayor that year. Regalado asked him to serve as commission chairman in 2011. But the two have since parted ways and Suarez has criticized the incumbent's management of the city's finances and Regalado's refusal to advocate for the hiring of more police officers. Suarez's father, Xavier, who was never found to have done any wrongdoing following his removal from office in 1997, was elected to the Miami-Dade county commission in 2011. On the one month anniversary of the Newtown, CT school shooting, mayors across South Florida and the country called for stricter gun regulations on Monday. Among them was Miami Mayor Tomas Regalado.